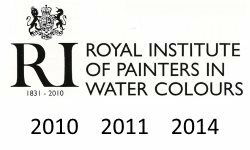 Paul Hoare has had his work accepted for the prestigious Royal Institute of Water Colour Painters at the Mall Galleries, London, on three ocassions. This highly competitive selected exhibition features the leading artists in Watercolour in the UK, including his Royal Highness, Prince Charles. Paul Hoare has recently been selected for the National & most prestigious Sunday Times Watercolour Competition, highly competitive, final selection of only 100 artworks. Paul Hoare has also been a grand finalist on the Channel 4 programme, Watercolour Challenge, and has exhibited at galleries in London and the Home Counties, as well as having work accepted by Museums and overseas clients. Inspired by the Cornish light on the land and seascape, Paul works en-plein-air and in his studio, overlooking Trevaunance Cove, St Agnes. Anyone is welcome to visit Paul Hoare's art studio, by appointment only. Paul can be contacted at: pauldhoare@btinternet.com or by telephone 01872 553235.